I am running Windows 10. Last week my system attempted to perform a major upgrade (to version 1803, April Creators Update), but the update failed and it rolled back to version 1709 (Fall Creators Update). Now when I try and sign into Windows 10, it says: 'Preparing Windows', then it says 'We can't sign into your account. This problem can often be fixed by signing out of your account and then signing back in. If you don't sign out now, any files you create or changes you make will be lost'. I then get a notification near the clock that says 'You've been signed in with a temporary profile. You can't access your files, and files created in this profile will be deleted when you sign out. To fix this, sign out and try signing in later.' I tried signing in and out for an entire week and I still can't access my files. Can you please help! " I asked Bob if he would like me to connect with him to have a closer look using my remote desktop support service, and he agreed. When I researched this issue, the first page I came across was from Microsoft which very briefly says to reboot the machine a few times, then run the system file checker utility, and if that doesn't work, create a temporary administrator account and delete the old user profile. This advice is easier said than done (and I'll explain it in detail further down). While I agree with this approach, the last part will certainly land you into some serious hot water because deleting the old user profile will also delete your user data, which is incredibly bad advice if you plan on keeping your Documents, Pictures, Videos, Outlook emails, etc! In Bob's case the reason why his update failed was because his file system was dirty (corrupted). This caused the upgrade to Windows 10 April Creators Update to fail; when the system reverted (with the file system still dirty), it further corrupted his user profile. Thus, he was no longer able to sign into that profile - even after I fixed the file system errors. Below I'll explain what I found and how I corrected the issue. There are so many variables involved as to why a user account (or Windows) goes corrupt and fixing it will be different in each case, depending on the circumstance. As such I'll explain step-by-step and in order the steps I would take to resolve this issue. First, run chkdsk (check disk) on the C drive to rule out a corrupt file system. To do so: log into Windows (even with a temporary account), then click Start and type in "CMD" (no quotes). Wait for "CMD.EXE" or "Command Prompt" to appear in the list, then right click it and select "Run as Administrator". Next, type in "chkdsk" and press Enter. Wait for chkdsk to complete. a. Chkdsk found no errors - in this case move onto Step #2.
b. 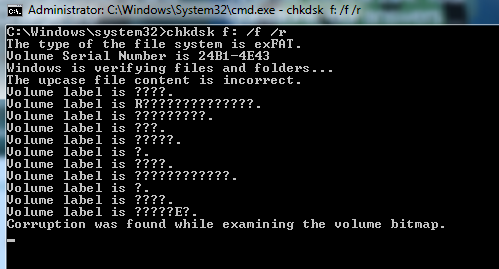 It might say "Volume Bitmap corrupt" or "Chkdsk found errors". In this case your file system is indeed corrupt and most likely the reason why your user profile is corrupt. You will need to type in "chkdsk /f" and press Enter to perform the error correction. If it says "Volume is in use", press "Y" to continue, then reboot the computer to have chkdsk complete the error checking and fixing on reboot. After the reboot, repeat Step #1 again. If it still says you have errors, enter "chkdsk /f" again, reboot, and run "chkdsk" until it says "Windows has scanned the file system and has found no problems" and proceed to Step #2. Now it's time to run the system file checker (SFC) utility. This is a Microsoft utility that comes with Windows and essentially checks to see if your operating system files are corrupt. SFC is a usually good indication of "how bad" of a state the operating system is (or is not), however it is not 100% reliable. For example, I have used SFC in the past and it has reported no errors, but the operating system was severely corrupted. To run the SFC utility, open an administrative command prompt (described in Step #1), then type in: "sfc /scannow" (no quotes) and press Enter. Wait for SFC to finish. a. SFC did not find any integrity violations. In this case (most of the time) you are good to go. Proceed to Step #3.
b. SFC found errors and corrected them. This is a good sign, but you will need to reboot the system and then run SFC /scannow again to see if it comes up with more errors. Proceed to Step #3 if SFC reports no errors. c. SFC cannot start or the scan aborts mid-process. This indicates your operating system is corrupt. If you get this response then will need to backup the system and reinstall Windows. If you do not know how to do this I can do it for you using my remote desktop support service. d. SFC found errors and could not correct them. This indicates your operating system is corrupt. If you get this response then will need to backup the system and reinstall Windows. If you do not know how to do this I can do it for you using my remote desktop support service. At this point, try signing into your corrupt user profile and pray it works. If you still receive the "We can't sign into your account" error message, then you will have to create a new user profile and move all your user data over to that profile. This is easier said than done and it may take a full day (or two, maybe more) to export old user data from programs such as Outlook (email), bookmarks, and other programs in order to re-import the user data into the new account - it all depends on how your user account is set up. You will also need to copy your Documents, Pictures, Videos, etc and any other personal data over to the new account. Note that you cannot "Move" the data using a "Cut" and "Paste" from one account to the other using the mouse, as this will also move the access rights of the files to the new account incorrectly, resulting in access denied errors. a. Open up an administrative command prompt (as described in Step #1), then type in "net user [user name] [password] /add" and press Enter. So, for example, if I wanted to create user "Dennis" with password "abc", the command is "net user Dennis abc /add". You should receive a response stating that "The command completed successfully." Next, give your user administrator access by typing in "net localgroup administrators [username] /add" and press Enter; it should respond with "The command completed successfully" - if it does not then you typed in something wrong - try again. b. Next, enable the Administrator account. Type in "net user administrator /active:yes" and press Enter. You should receive a response stating that "The command completed successfully." c. Next, sign off of the temporary account and sign in as the new user you created. It will go through the process of creating a new account - it may take anywhere from 30 seconds to 20 minutes to do so. Once you are signed in, try accessing the Start Menu and load up Edge and other parts of Windows to make sure the system is working properly. If you are satisfied that things look correct and you don't receive any weird error messages, then sign off of the new user account. d. Next, sign in as the Administrator user. Once you reach the desktop, click the File Explorer icon near the Start menu and navigate to the "C:\Users\[your corrupt user name]" folder. Select all files and copy them to C:\Temp (you may need to create Temp folder first). This will create a duplicate copy of your current user files without taking the access permissions with them. Sign off as Administrator user. e. Next, sign in as your new user account and navigate to "C:\Temp" folder. Press CTRL + A to select all files and then right click over a highlighted folder and select "Cut" to cut all folders in C:\Temp. Next, navigate to "C:\users\[your new user name]", then right click an empty area in File Explorer and select "Paste" to move your old user data into the new account. f. Keep your old, corrupt user profile until you are 100% certain all data has been exported. Some data, such as Outlook, and Bookmarks from your web browser won't be copied over when you "cut" and "paste" data from the old account to the new account. The reason being is that some data needs to be manually exported, or the data may be in another location (such as "%appdata%"). This can be rather tricky especially if you can't sign into the old corrupt account to perform the export. You may have to search Google on how to locate and export the data manually. This may be over your head, and if that is the case you can contact me for additional support, described next. Recovering from a corrupt user account is not fun, especially if you've never had to deal with it before. If all of this is over your head, or if you need help creating a new account and moving your data over, I can help using my remote desktop support service. Simply contact me, briefly describing the issue and I will get back to you as soon as possible.